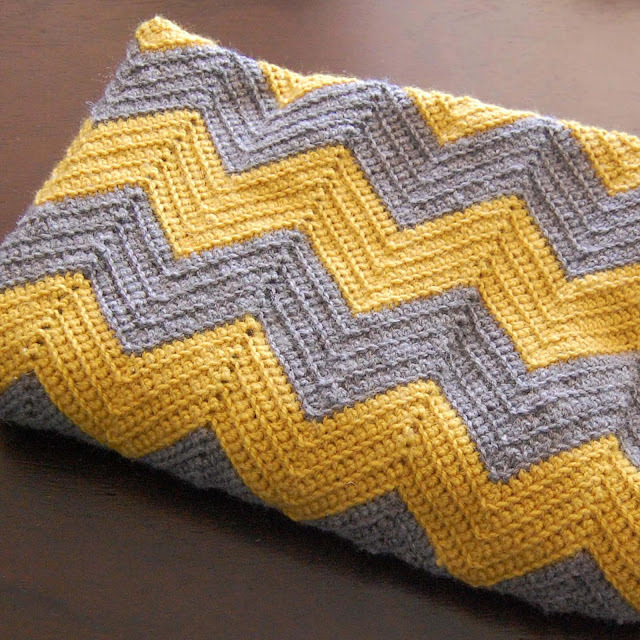 39 comments on "DIY Crochet Chevron Baby Blanket"
looks lovely - aren't you clever! That blanket is gorgeous! I used to know how to crochet but have lost the skill. I really want to get back to it. Something about winter makes me want to knit and crochet all the things. I am so impressed. First time, what a fantastic effort. I've started crocheting last year, I love it. I tend to go with the granny square alot because it doesn't require as much concentration. I've got a black and pink chevron on the go. Once you start you'll never stop. Have fun with that. That is the most divine looking blanket, I love the colours, I love the chevron pattern! I don't know how to crochet and I think I might just stick to sewing because I don't think I have enough patience! What a fantastic cot! And to think we just recently took ours down for the last time ever! 3 kids have slept in it and I'm hesitant to let it go :( Love the crochet! It makes me feel so warm and cosy just thinking about crochet blankets!! I'm hooked! I have a feeling the skill would come back pretty easily!! #5!!!!!! I don't think I have the patience for a #5 haha, I'll stick to crocheting! Ohh black and pink chevron divine!! I have yet to try a granny square, but it is on my list! Yeah the thought of blankets would probably make you break out into a sweat... It was the same when I lived in Florida. So perfect for her, I'm just so glad I finished it in time, she can come any time now!! I just bought it off of Gumtree for a BARGAIN!! I love it so much!! I was so surprised that it is actually pretty easy, I put it off for so long because I thought it would be so much harder! It's gorgeous! I love to crochet and wanted to make a blanket for my little bean, but I just haven't done it...I fail! Well done, fellow lefty! I had a difficult time teaching myself crochet in this right-handed world. Your blanket turned out splendidly. Beautiful! I'm just wondering.... how much yarn did this pattern take? I can't find that info on the tutorial page. Thanks! What brands/colors of yarn did you use for this? I love the colors! Somebody else already asked this, but how much yarn did it take to complete? I'd hate to have to run out to buy more halfway through the project (and not find the original colors! Eeek!). I also taught myself to crochet & found a lady called 'Girly Bunches' on YouTube very helpful. The blanket is gorgeous, well done. I love the blanket and also the 'Wrinkles' Dog you have in the cot - I have a 'girl one' that I got when I was little and my parents have recently brought up for my daughter to have! The Wrinkles was my husbands from when he was little. They are so cute, I need to get a girl one too! Oh I wish I knew. I am so bad at keeping track and I had to keep running to the store to buy more. I would say at least 300g of each colour but maybe more... sorry I can't be more specific! And that is exactly what I kept doing, running back to the store all the time! So I completely lost track of how much I used.. so so sorry. All I know is that it was A LOT! What are the names of the colors you used, I can't for the life of me match them. This is a great first effort, wish I could crochet! Where did you get this wonderful bassinet?? I love it! This is gorgeous!!! I will definitely be making one of these - I've been searching for THE perfect chevron crochet pattern to duplicate some old afghans my husband's grandmother made. This is the one! Also, if you don't mind, could you share your left-handed videos? My sister-in-law wants me to teach her to crochet, but she's a leftie. She swears she can do it right-handed, but it's not clicking with her, you know?